Space is limited; RSVP to confirm your seat and receive updates on the Better Market Street project. After the screening, join panelists, including Walk SF’s Elizabeth Stampe, the Civic Center Community Benefit District’s Donald Savoie, SF Planning Department’s Neil Hrushowy, and the filmmaker Darryl Jones, to share your own perspective as part of a discussion with designers, planners, and other Market Street users about the future of San Francisco´s greatest street. The film, shot in 2012, spurs a dialogue about the future of Market street and preserves an experience of the corridor before its transformation. 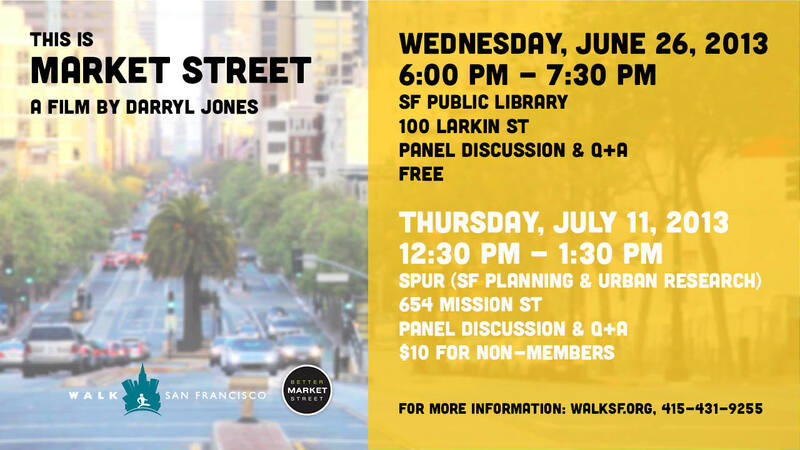 Share your own perspective as part of a discussion with the filmmaker, designers, planners, and other Market Street users about the future of San Francisco’s greatest street.